My Wall Street journey started with Bloomberg in 2009. Since then I’ve held positions in equity research at a sell-side shop, as a senior analyst at a hedge fund, and eventually, as the director of research for a startup building research automation tools. During that time, I have produced hundreds of reports, models and recommendations on publicly traded equities. As a result of this, I’ve been able to develop a profound understanding of the value, as well as the pitfalls of equity research. This article is intended to share with you some of the most important lessons I have learned, and guide you on how to use research reports more effectively. Whilst the equity research industry worldwide has endured substantial declines since 2007, there are still roughly 10,000 analysts employed by investment banks, brokerages, and boutique research firms. And even more analysts offer their services independently or on a freelance basis, and there are still more voices in the crowd contributing to blogs or sites like SeekingAlpha. The reason for the above is clear: equity research provides a very useful function in our current financial markets. Research analysts share their insights and industry knowledge with investors who may not have them, or may not have the time to develop them. Relationships with equity research teams can also provide valuable perks, such as corporate access, to institutional investors. Nevertheless, despite its obvious importance, the profession has come under fire in recent years. Analysts’ margin of error has been studied, and some clear trends have been identified. Some onlookers bemoan the sell-side’s role in stimulating equity market cyclicality. In some cases, outright conflicts of interest muddle the reliability of research, which has prompted regulation in major financial markets. These circumstances have generated distrust, with many hoping for an overhaul of the business model. With the above in mind, I’ve divided this article into two sections. The first section outlines what I believe the main value of equity research is for both sophisticated and retail investors. The second looks at the pitfalls of this profession and its causes, and how you should be evaluating research in order to avoid these issues. As sophisticated or experienced investors, you likely have your own set of highly developed valuation techniques and qualitative criteria for investments. You will almost certainly do your own due diligence before investing, so outside parties’ recommendations may have limited relevance. Even with your wealth of experience, here are some things to consider. Regulations prevent corporate management teams from selectively providing material information to investors, which creates limitations for large fund managers, who often need specific information when evaluating a stock. To circumvent this, fund managers often have the opportunity to meet corporate management teams at events, hosted by sell-side firms that have relationships with executives of their research subjects. Buy-side clients and corporate management teams often attend conferences that include one-on-one meetings and breakout sessions with management, giving institutional investors a chance to ask specific questions. Language around corporate strategies, such as expansion plans, turnarounds, or restructuring, can be vague in conference calls and filings, so one-on-one meetings provide an opportunity to drill down on these plans to confirm feasibility. Tactful management teams can confirm the legitimacy and plausibility of strategic plans without violating regulations, and it should quickly become obvious if that plan is ill-conceived. Institutional clients of sell-side firms also have the opportunity to communicate the most relevant topics that they want to see addressed by company management in quarterly earnings conference calls and reports. The sell-side analyst’s public role and relationship with corporate management also allows him to strategically probe for deeper insights. Generally, good equity research demonstrates the analyst’s emphasis on teasing out information that is most relevant to institutional clients. This often requires artful posing of incisive questions, which allows management teams to reach an optimal balance of financial outlook disclosure. Buy-side analysts and investors have a massive volume of sell-side research to comb through, especially during earnings season, so succinct, analytical pieces are always more valuable than reports that simply relay information presented in press releases and financial filings. If these revelations echo the interest or concerns of investors, the value is immediately apparent. Smaller buy-side shops may lack the resources to monitor entire sectors for important trends. These asset managers can effectively widen their net by consuming research reports. Sell-side analysts tend to specialize in a specific industry, so they closely track the performance of competitors and external factors that might have sector-wide influence. This provides some context and nuance that might otherwise go unnoticed when concentrating on a smaller handful of positions and candidates. Research reports can also be useful ways for shareholders to spot subtle red flags that might not be apparent without carefully reading through lengthy financial filings in their entirety. Red flags might include changes to reporting, governance issues, off-balance sheet items, and so forth. Buy-side investors will of course dig into these issues on their own, but it’s useful to have multiple eyes (and perspectives) on portfolio constituents that may number in the hundreds. Likewise, building a historical financial model can be time consuming without providing the best ROI for shops with limited resources. Sell-side analysts build competent enough models, and investors can maximize their added value by focusing entirely on superior forecasting or a more capable analysis of the prepared financials. Identifying investment opportunities falls under the umbrella of tedious activities since effectively screening an entire market/sector can be overwhelming for a smaller team at some buy-side shops. As such, idea generation has become an important element of some sell-side firms’ offerings. This is especially pronounced regarding small and medium cap stocks, which may be unknown or unfamiliar, to institutional investors. It’s simply impractical for most buy-side teams to cover the entire investable universe. Research teams fill a niche by identifying promising smaller stocks or analyzing unheralded newcomers to the market.They can then bring this to the attention of institutional investors for further scrutiny. Reports might be most useful for sophisticated investors as an opportunity to develop a meta perspective. Stock prices are heavily influenced by short-term factors, so investors can learn about price movements by monitoring the research landscape as a whole. Consuming research also allows investors to take the temperature of the industry, so to speak, and compare current circumstances to historical events. History has a way of repeating itself in the market, which is driven in part by the industry’s tendency to shake during crashes, and pull in new professionals during bull runs. Having a detached perspective can help shed light on cyclical trends, making it easier to identify ominous signals that might be lost on the less acquainted eye. In turn, this drives idea generation for new investing opportunities. With that being said, investors should not consume research that only confirms their own bias, a powerful force that has clearly contributed to historical booms and busts in the market. The value of equity research is much more straightforward for retail investors, who are usually less technically proficient than their institutional counterparts. Retail investors vary substantially in sophistication, but they mostly lack the resources available to institutional investors. Research can supplement deficiencies on some basic levels, helping investors with modeling guidance, framing an investment narrative, identifying relevant issues, or providing buy/sell recommendations. These are great starting points for retail investors seeking value out of research. Individuals probably can’t consume the sheer volume of reports that asset managers can, so they should lean on the expertise of trustworthy professionals. What are the risks associated with equity research? Despite the above, there are clear risks to over-relying on equity reports to make trading decisions. To properly assess the dangers of equity research, one must consider the incentives and motivations of research producers. Regulations, professional integrity, and scrutiny from clients and peers all play significant roles in keeping research honest, but other factors are also at play. Research consumers should be mindful of the producer’s business model. I highlight the five key issues below. Reports that are produced by banks and brokers are usually created for the purpose of driving revenues. Sell-side equity research is usually an add-on business to investment banks that earn significant fees as brokers and/or market makers in traded securities and commodities. As a result of this, research tends to focus on highlighting opportunities for buying and selling stocks. If research reports only included forecasts of “steady” performance, this would result in less trading activity. The incentive for research analysts is therefore to come out with predictions of a change in performance (whether up or down). This isn’t to say the content of the research is compromised, but that opinions on directional changes in performance may be exaggerated. Numerous academic studies and industry white papers are dedicated to estimating the magnitude of analyst error. The findings have varied over time, between studies and among different market samples. But all consistently find that analyst estimates are not particularly accurate. 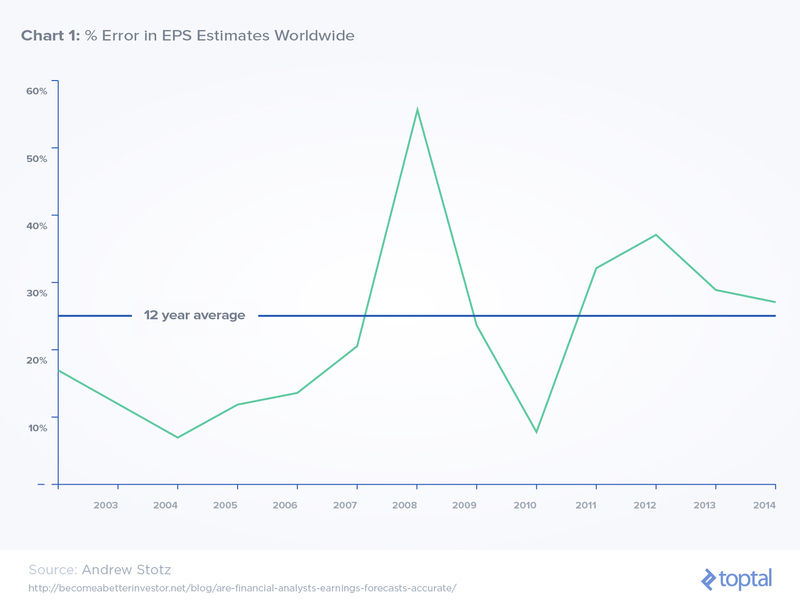 Andrew Stotz indicates an average EPS (earnings per share) estimate error of 25 percent from 2003 to 2015, with an annual minimum under 10 percent and annual maximum over 50 percent. Another important point to consider is that analysts generally benefit from having a positive working relationship with the executive management and investor-relations teams of their research subjects. Analysts rely on corporate management teams to provide more specific and in-depth information on company performance that is not otherwise publicly provided. Brokers also provide value to investors by providing seminars and one-on-one meetings that are attended by those executive teams, so a strong roster of presenters at conferences can be dependent on the relationships built by the research teams. One of the tech analysts at a company I worked for was covering a small-cap stock and built up a good relationship with both the corporate management team and the investor relations person who worked with them. Being a small company, this visibility was valuable to the research subject. Poor results one quarter were downplayed by management as a temporary speed bump, but the analyst had concerns that these were longer-term problems. The executive team was upset when the subsequent report negatively portrayed the recent events, and soon thereafter withdrew from an upcoming conference our research firm hosted. The analyst’s bonus compensation suffered as a result as well. Obviously, this all has very serious implications. Sell-side analysts tend to produce reports that portray their subjects favorably, and they are more likely to set attainable expectations. It also means that analysts may hesitate to downgrade a company’s stock. This is especially true when poor executive management would be the primary culprit causing a downgrade. 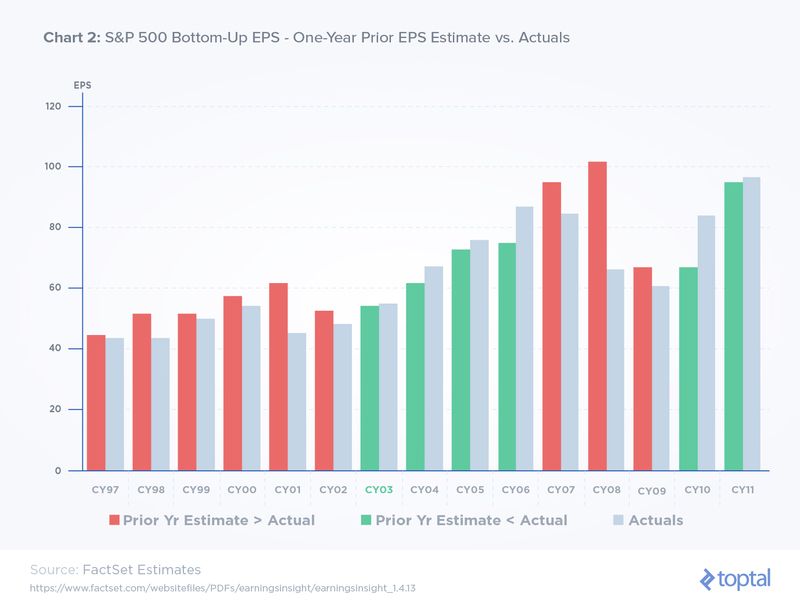 All of this may help explain why EPS estimates are disproportionately bullish (see chart 2). Research analysts may avoid making contrarian calls due to the need to maintain good reviews and a trusted reputation. Equity research reports are influenced by the means by which analyst quality is measured. Analysts compete with peers at rival banks. Taking a contrarian stand that results in bad recommendations could genuinely harm an analyst’s compensation and career prospects. These mechanisms create a herd-like mentality. This can be extremely detrimental if it goes unnoticed or unaddressed by research consumers. These are precisely the sorts of circumstances that fuel bubbles. It’s hard to look especially foolish if everyone else looks foolish too. Independent equity research may be sensationalized due to the need to stand out. Research produced by independent firms, which substantially derive all revenues from the sale of research and do not maintain a brokerage business, is not meant to motivate trading. This eliminates some of the conflicts of interest inherent in the sell-side banks, putting extra emphasis on accuracy. However, independent and boutique analysts are tasked with creating income by selling something that’s been largely commoditized, and they compete with banks that have vast resources. To survive, they have to offer something specialized or contrarian. Their philosophy must radically depart from the herd. They have to claim special industry knowledge through independent channels, or they must cover stocks that are largely uncovered by the larger powers in the research space. This creates the incentive for sensationalized research that can attract attention amongst the sea of competing reports. As we have seen, there are important facets of the equity research profession that often lead to skewed incentive mechanisms, and may ultimately compromise the quality of research being done. To be fair, the practice of making complex and precise forecasts is necessarily flawed by the requirement to make assertions about future conditions, which by definition are unknowns. Nevertheless, whilst this might be acceptable if the errors appeared random and with a predictable margin of error, this is not the case. Analysts tend to be too bullish. In 10 of those 15 years, consensus estimates were higher than the reported figures. Analysts were especially bad at navigating recession periods, overcooking their numbers by 36 percent in 2001 and 53 percent in 2008. The error is less extreme for years with rapid EPS growth. Forecasts only lagged actual results by eight percent in 2010, indicating asymmetric tendencies to misforecast earnings. How can you avoid equity research pitfalls? There are several ways that consumers of research reports can judge the validity and quality of such reports,in light of what’s been discussed above. Analyst credentials are an obvious method for vetting quality. CFA designations don’t necessarily guarantee quality, but it indicates a baseline level of competency. Research produced by reputable banks ensures that it was created and reviewed by a team of professionals with impressive resumes and highly competitive skills. Likewise, veterans of big banks who leave to start an independent shop have been implicitly endorsed by the HR departments of their former employers. Producers can also be distinguished by specialized backgrounds, for example former doctors turned healthcare analysts or engineers weighing in on industrial/energy stocks. If the analyst has been recognized in financial media, it usually indicates extremely high quality. Investors can also look at historical analyst recommendations and forecasts to determine their credibility. Institutional Investor provides a service that tracks analyst performance, and there are similar resources available, especially for investors with deep pockets. Fintech startups, such as Estimize, actually focus on attracting and monitoring analyst recommendations to identify the most talented forecasters. However, while third-parties and financial media offer helpful ranking systems based on earnings forecasts or performance of analyst recommendations, these tend to put a lot of emphasis on short-term accuracy. This might therefore be less useful for consumers with a long-term approach or emphasis on navigating black swans. Investors should consider these factors and look for red flags that an analyst is hesitant to turn bearish. These could include shifting base assumptions to maintain growth forecasts and target prices, suddenly shifting emphasis away from the short-term to the long-term outlook, or perhaps an apparent disconnect between the material presented in the article and the analyst’s conclusions. Investors should also consider context. Some stocks simply don’t lend themselves to reliable research. They might have volatile financial results, an unproven business model, untrustworthy management, or limited operating history, all of which can lead to wide margins of error for earnings growth and intrinsic value. The business cycle’s phase is also extremely important. Research shows that forecasts are less reliable in downturns, but investors are also more likely to rely most heavily on research during these times. Failure to recognize these issues can severely limit one’s ability to glean full value from research. Research consumers should also make sure they know their own investment goals and be mindful about how these differ from those implied by research reports. A temporal mismatch or disconnect in risk aversion could completely alter the applicability of reports. For those fund managers wishing for a more reliable research product, the most effective move is to vote with your wallets, and buy reports from the most accurate and conflict-free sources. It might be expensive to source research from multiple sources, but there’s value in diversifying the viewpoints to which you are exposed. It’s unlikely that you will move on from low-quality research if that’s all you are reading. Additionally, consuming a large volume of research from different sources helps forge a meta perspective, allowing investors to identify and overcome worrisome trends in research. The equity research industry has undergone profound changes in recent years, due to regulatory changes, the emergence of independent research shops, as well as more automated methods of analyzing public company performance. At the same time, smart investors are looking at broader sets of investments and taking a more active approach to research. This is facilitated by the increasing quantity of publicly available information on listed companies. Nevertheless, good research continues to be extremely valuable. It lets you manage a wider pipeline of investment opportunities and be more efficient. An informed and thoughtful approach can enhance the value of research reports for investors, so asset managers can better serve clients (and their own bottom lines) by considering the content above. Research consumers need to be wary of predictable errors, analyst incentives, conflicts of interest, and the prevalence of herd-like mentality. If you can adjust your interpretation of research along these lines, then you can focus on the most valuable aspects of research, namely idea generation, corporate access, and delegation of time-consuming activities.